We’d love your help. Let us know what’s wrong with this preview of The Insect Dialogues by Marc Estrin, Frederick Ramey. In 2016, Marc Estrin decided to publish Kafka’s Roach, the unedited version of the manuscript that a dozen years earlier Fred Ramey had acquired, edited, and published under the title Insect Dreams: The Half Life of Gregor Samsa. 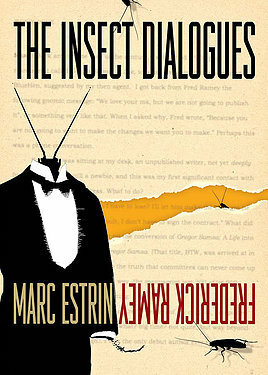 Estrin’s decision raises questions about the editor’s role in the life of a book, the trajectory of one author’s career, and whether a published In 2016, Marc Estrin decided to publish Kafka’s Roach, the unedited version of the manuscript that a dozen years earlier Fred Ramey had acquired, edited, and published under the title Insect Dreams: The Half Life of Gregor Samsa. Estrin’s decision raises questions about the editor’s role in the life of a book, the trajectory of one author’s career, and whether a published novel is a stable thing anymore. All of that is worth a wide discussion, and so Ramey asked his erstwhile author to engage in a colloquy. To ask other readers questions about The Insect Dialogues, please sign up.